Yes, will be installing SYE, hopefully I can leave TC in while installing. I've always used Advance Adapters stuff, unless another brand of SYE is preferred. And new driveshaft. Have always used Tom Woods. Good idea on ordering springs individually. I've been known to take them apart and powder-coat. Are the ARB leaf springs ...shackle & main eye bushings same OD as stock? Taking the springs apart to put on a better finish would be a good idea. The finish they come with is nothing to get excited about. I noticed rust on edges and corners after my first trip on the new springs. And yes, as was already pointed out, stock spring eye bushings are what the ARBs use. BTW, not that it is likely to be an issue on this vehicle, but it still would be a prudent step to hit those spring eye bolts (and the upper shackle bolt) with Kroil the day before you plan to pull them. There are plenty of nightmare threads to be found on here where folks have had those bolts refuse to come out. (The nut is a welded captive inside the body/frame rails) The exposed threads on the upper shackle bolts can be accessed if you remove the rear bumper and bumper brackets. The front spring eye bolt is not so gracefully accessed. I highly recommend replacing all six of those bolts (they are all the same bolt). When I did mine they were still available from Mopar at about $8/apiece. Not cheap, but worth every penny if they prevent a nightmare down the road. i have been extermly happy with my OME 3 inch heavy duty springs. i am also using iro's adjustable short arms since they are rubber bushing on both ends. i don't really hear the suspension squeak. OME's customer service has decent to deal with as well, i had a spring come apart during shipping( centering pin). after a call they shiped me out two pins. only for me to find i was missing some of the rubber slipper plates between the springs. called them again and out goes another shipment. These are the DPG Offroad spring plate / bump stops that I put on with the OME springs. Nice Red 2 Door Love the look & stance ! That looks like good solution to bumpstop the rear. I spy 2 pucks on the DPG spring plate. Did you order DPGB2 to get the 2 pucks? Also noticed you don't have shims under springs, did you correct with welded on spring pads? On DPG website pics of spring plate it shows what looks to be square tubing and another type of rubber/ poly bumpstop from top of XJ unibody. Anak ... thanks once again, and nice pics showing quality differences in JB - vs - AA. I'll get the Moog bushings ordered. I've got a shop press or ball joint press so no problem installing bushings. Nutserts & captive nuts are often problem as they spin so easily. Silver antiseize goes a long ways keeping bolts easy to remove. I saw somewhere there was aftermarket nut strip plate, think at Azzy's. Dragonlich1961 ... thanks for review of OME / ARB springs & rubber bushings. Here's Black Beauty's twin sister with 45K miles on BAT. Similarly high optioned with power windows & RKE but no towing pkg. the pucks are hockey pucks. I can't quite tell from the photos - don't forget to give those DPG plates a coat of paint! 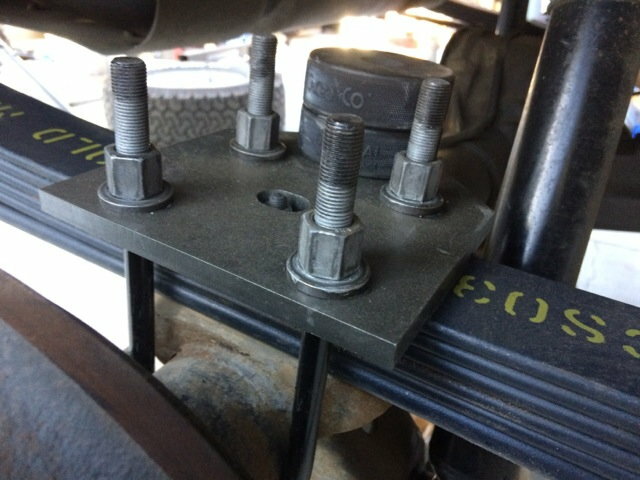 The captive nuts on the leaf spring brackets are NOT inside the frame rails - the "inner" surface of the spring mounts have a bump out section around the bolt, and the captive nut is inside this, between the hanger bracket and the outside of the frame rail. You can cut open a flap on the bottom of the bracket to access the nut. Low mileage or not, definitely soak the bolts good in quality penetrant. Offset bumpstop for shock clearance. Although I read that moving shocks may be required? Got the IRO U bolts are they are gold zinz to match Metal Cloak control arms & trackbar. From all the reading I've been doing over last few days, a CV driveshaft and rotating the axle to point at transfercase, slightly downward... with weld on pads is best way to accurately accomplish. VS shims. 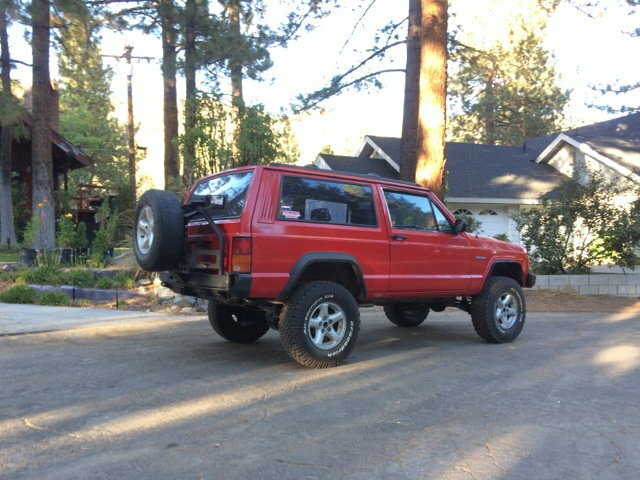 I still haven't ordered rear springs, as from what I can gather, 3.5" lift makes the stock shackle angle @ 90 degrees. Which is stiff riding. 45 degree is of course optimal. So have to use shackle relocation brackets which all give lift and require boomerang longer shackles. So I'm at quandy of what to do for the rear lift. i am a fan off hd offroads no lift relocation brackets. they due require cutting. Read thru the thread on cutting for the no lift shackle relocation brackets, don't think I can bring myself to cut on Black Beauty. I'm thinking of getting the bolt on HDOffroad lift style & still wondering which lift spring to get. OME 2.5" spring? Which shackle works with HD Offroad relocating brackets? Want to keep the stance level. Goal is 31" tires. Welding on spring perches will save 1/2" of lift from not using steel 4 or 6 degree shims. screw welding perches unless you're changing axles. Shims are not 1/2" thick, maybe 1/4". You might not even need shims, I run a SYE with bolt in shackle relocators and RE boomerangs with OME springs (dont remember the height), no shims. The relocators and shackles kicked the pinion angle up, I don't have any driveline issues. Weasel ... yea your right alot of work unless changing axles. Kyle ... Interesting what luck you have. Even with planning, nothing ever works out easy for me. This is best thread I've been able to find on Metalcloak lift. His rear is high even after removing a leaf & coil spring spacer. The consensus in that thread, is that leaf spring relocator boxes are necessary for good shackle angle. So with HD relocator lift boxes, I figure .75" lift on stock shackles at 45 degree angle, and .25" shims and 2.5" springs should give 3.5" lift. So guess I'll install and see if I get level stance, then can fine tune with longer shackles. Now to look for 2.5" leaf springs. On side note the 40K mile stock Black Beauty twin sister sold for $14,000 on Bring A Trailer. That makes me feel better about dumping coin in this one. 40K was from MO which they use salt on the roads and the undercarriage & engine compartment are a little rusty. Where I am from that 40k 2001 Jeep is lick-able clean, we dont even classify that as rust, lol. I agree with what has been said earlier in this thread in regards to the 20k black beauty jeep. I would just drive it, at only 20k is not even mofo broken in yet. At most I would go with a budget boost and keep the rear sway-bar since a fresh 16yr old driver will be behind the wheel. Let the driver and jeep season a bit, then start the chopping up. The danger is not really the 16yr old driver as much as it is the other drivers and the lack of experience dealing with them/handling a lifted jeep. Not trying to tell you what yo do, but after seeing a few fathers face some rollovers and really close calls easing into this project might just be a good thing. Michigan Rust Bomb... You are right, I should of eased into this project, but I'm programmed to do everything while I'm at it... which is always a slippery slope Plus daughter thinks the tiny tires are wimpy looking & the Jeep has the factory installed cassette player which dates the look. The 40K Black Beauty is very nice, much nicer than any 2 door XJ I have ever seen looking intensely for 3 years, before I found 25K Black Beauty. I'm glad it brought good coin on BAT, although 14K doesn't buy much of a nice 4x4 vehicle anymore. As a concerned parent, I worry about my kids (and others) safety, main reason I picked XJ over removeable top LJ. I will only use the very best suspension components & tires/ wheels & brakes. I do plan on keeping F&R sway bars, possibly upgrading to Currie or ORO bars. Installing lift myself & daughters help, with everything properly set & torqued to spec. If Black Beauty doesn't drive perfect after small 3.5" lift and small 31" tires, then I'll sell it before I risk safety. My daughter has been driving lifted Jeeps and trucks since she was 13 as we live on acreage and miles of trails. At age 8 she's been driving Polaris RZR170 and at age 3 was driving dual battery 24V kiddie Jeep. So she's well versed for age 16. I am also installing front and rear high definition camera's with DVR recording, so I can document any accident or wreckless driving on her part. For sound system going in Back Beauty.... I am looking for Infinity tweeter sail panels in Agate... which would not require drilling a hole in the door panels. I know they are hard to find so I will pay bounty of 250 for a pair ! My latest thought is... I've got to decide if I want the Boostwerks and Warn 8000# winch on this Jeep. That will add around 200# of weight to front and so probably won't get true 3.5" lift. Therefore, I haven't pulled trigger on rear springs or shackles.